If you're depending on a room filled with 90-year-olds to repopulate and save the human race, you may be setting your hopes a little too high. That's an analogy Utah State University researcher Paul Rogers uses to explain the challenges before Pando, a massive aspen clone in south central Utah thought to be the largest living organism on Earth. "Pando is an iconic example of an aspen community undergoing rapid decline due to overstory mortality and chronic recruitment failure," says Rogers, director of the USU-based Western Aspen Alliance and adjunct associate professor in the Department of Wildland Resources and USU Ecology Center. Yet, restoration treatments by the USU scientist and colleagues may be working. Rogers and Jody Gale of USU Extension Sevier County publish findings indicating evidence of Pando's recovery in the Jan. 19, 2017 issue of Ecosphere. The USU scientists' research was supported by the U.S. Forest Service, the Secure Rural Schools program, the Utah Forest Restoration Working Group, USU Extension and WAA's Pando Fund. "Quaking aspen across the American West are stressed by a combination of sources, including drought, hungry herbivores, fire suppression, development and past management practices," Rogers says. 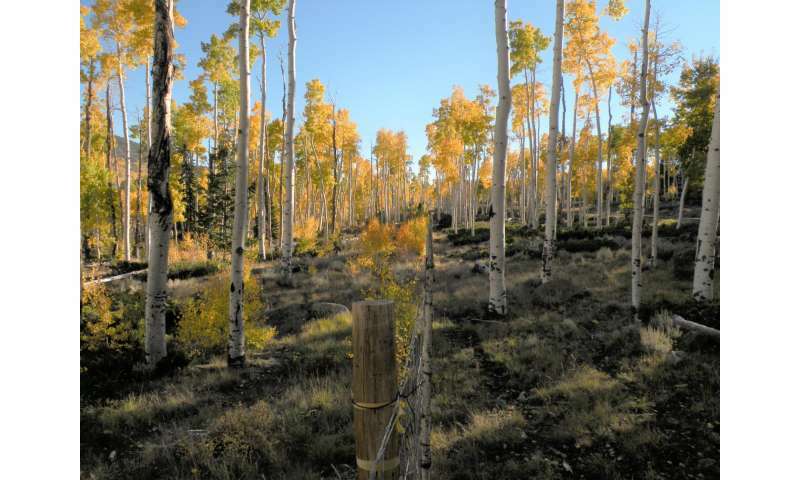 "As part of a larger project to restore Pando, we fenced, treated and monitored a portion of this famous grove with the intent of documenting regeneration responses and using such practices at larger scales." He and his team placed 27 randomly stratified monitoring plots across the 43-ha aspen community to monitor herbivory and regeneration responses to distinct treatment categories. Treatments included plots left unprotected and protected by fencing, passive (fenced only) treatment and active treatments such as burning, shrub removal and selective overstory cutting. "At each site, we made extensive measurements of treatment responses," Rogers says. "Our results confirmed a positive regeneration response to limiting access to munching deer and other herbivores with fences, whereas non-fenced areas showed no improvement." He notes both active and passive treatments produced regeneration levels sufficient to protect young aspen suckers, until they grow beyond the reach of ravenous browsers. 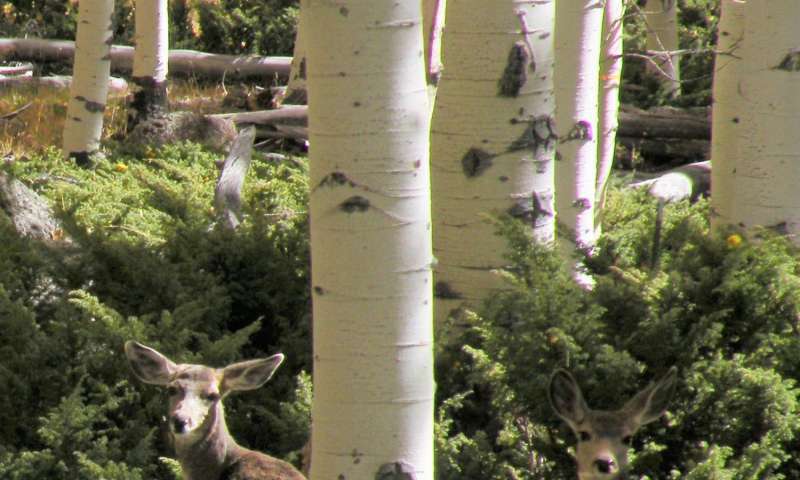 "Our results support a growing body of research, which suggests if managers invest in continuous protection from herbivory, they'll give Pando, as well as other western aspen communities, a fighting chance," Rogers says.